Fig. 1-3-2-4 shows the number of persons newly received by public prosecutors offices for violations of the Commercial Code (Act No. 48 of 1899 prior to the revision by Act No. 87 of 2005), the Companies Act (Act No.86 of 2005; enforced on May 1, 2006), the Anti-Monopoly Act, and the Financial Instruments and Exchange Act (Act No. 25 of 1948; the title of the act was “Securities and Exchange Act” prior to September 30, 2007) over the last 20 years. In FY 2008 the Securities and Exchange Surveillance Commission filed formal accusations regarding Financial Instruments and Exchange Act violations against 27 persons (including juridical persons) in 12 cases. Of these, nine persons in six cases were accused of “insider trading,” 16 persons in four cases of “submission of false securities reports, etc.,” and two persons in two cases of “spreading of rumors and fraudulent means, assault and intimidation” (Source: The Securities and Exchange Surveillance Commission). The Japan Fair Trade Commission filed an accusation against nine persons (including juridical persons) in one case for Anti-Monopoly Act violations (Source: The Japan Fair Trade Commission). Table 1-3-2-5 shows the number of persons prosecuted or not prosecuted for violations of the Commercial Code, the Companies Act, the Anti-Monopoly Act, and the Financial Instruments and Exchange Act (the Securities and Exchange Act) over the last five years. 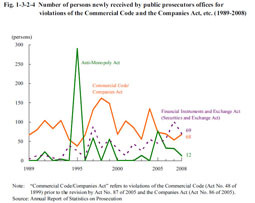 Examining the details of prosecution in 2008 revealed that two of 27 persons prosecuted for violations of the Commercial Code and the Companies Act and eight of 56 persons prosecuted for the violations of the Financial Instruments and Exchange Act were put on summary trial procedures, and the others were all indicted (Source: Annual Report of Statistics on Prosecution).